New OC 7 will be Wing Commander rank, for some years the Squadron has been commanded by a Squadron Leader working under the Command of OC JSFW. More details to follow. 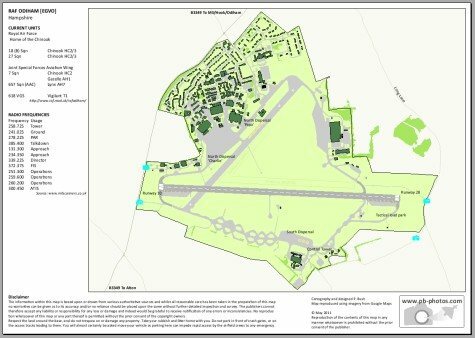 RAF Odiham has been the home for No 7 Squadron since it's reformation in 1982 when it re-equipped as a Chinook HC1 Squadron under the Command of Wg Cdr Martin Mayer, having previously disbanded as a Canberra Target Facilities Squadron at RAF St Mawgan. The Chinook HC1 was the RAF's second tandem-rotor helicopter, the first being the bristol Belverdere, unlike the Belvedere the Chinook quickly developed into the RAF's go-anywhere, do-anything choice of Battle-field Helicopter. Capable of lifting over 50,000 lbs at speeds up to 150 mph, being able to operate IFR and at ultra-low-level the Chinook fitted the Squadron's motto "Per Diem per Noctem" (By Day and by Night) perfectly, as the use of Image Enhancing Vision equipment permitted the Chinook to fufill all it's roles by night or by day. The Chinook has proved itself in numerous theatres of operation, often sustaining battle-damage that would have caused the loss of a lesser machine, this along with it's prodigous excess power has endered the Chinook to both users and Operators. Over recent years the Squadron has been part of the Joint Special Forces Wing based at RAF Odiham, this role necessitates a high degree of security but some insight to recent activities will be allowed in due course. The Squadron continues to maintain the high standards of performance, accuracy and bravery that have been it's signature since the Squadron's formation at Farnborough on 1 May 1914. Flash-back 25 years. Chinook ZA671 "EO" in it's 1989 75th Anniversary livery, this aircraft was used through the 1989 Display season by Pilot Flt Lt Mal Reeves (when I was young and had hair and a waist-line) and the Display Crew at over twenty airshows and displays throughout the UK. This photograph of EO shows it over the Needles Lighthouse on the Isle of Wight, flown on this occaission by Wg Cdr Keith Ifould AFC OC 7 Squadron. 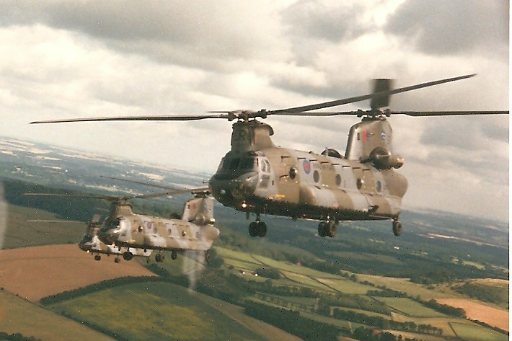 Part of a 7 Squadron seven-Chinook formation flown in 1988 whilst the Squadron was under the Command of Wg Cdr Alan Hopper.